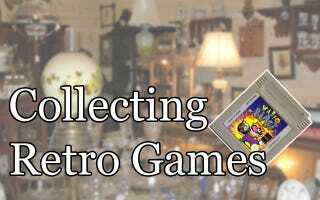 Welcome to Collecting Retro Games, a series of articles that gives beginners and the experienced collector tips and tricks to building a good gaming collection, while avoiding the common mistakes and pitfalls of the hobby. Whether you are a seasoned collector, an excited beginner, or are simply curious about people who have the hobby, I hope you all find something interesting and informative. So far we’ve covered the what, the where and the how of collecting video games, and so far those articles have assumed that you are a person who is interested in having a slew of games filling your shelves. A lot of gamers like to have a lot of variety in the games they play and eventually collect. But that doesn’t cover everyone. For some people, some games just stick out more than any and become THEIR FAVORITE GAME EVER. And while they like other games just fine, they gravitate back to that same game and it becomes a defining part of who they are. Or they already collected all the games of a particular generation that they wanted and now want to know what’s next. And that’s where other gaming collectibles come into play. In the immortal words of Yogurt from Spaceballs, it’s all about the merchandising! Gaming memorabilia is its own hobby with it own set of problems and pitfalls that are easy to get lost in. Suddenly trying to figure out where you’ll find a copy of Zombies Ate My Neighbors doesn’t seem as intimidating as trying to figure out if you should buy a bunch of Pokemon plushies, or if you should just stick to statues. Do you invest in the high end prop replicas? Or do you just want some cool game art on your wall? It can get very overwhelming, very fast. There are a couple of ways to approach a non-game gaming collection. The best two are to either focus on the things you like, or the games you like. It also helps to look at some stuff you already collect and simply expand it to include gaming versions of it. Already collect concert t-shirts? Then it isn’t hard to expand into shirts with gaming logos or references. Do you like books? Then you can expand into game guides, art books and novelizations of certain franchises. I personally collect a lot of dolls and action figures, and am a big fan of Pokemon, Kingdom Hearts and Final Fantasy. So between my Batman figures and Barbie dolls, you’ll find a lot of Pokemon toys and Play Arts figures on my shelves and desks. A lot of very popular franchises have a slew of merchandise from high end art statues, blind box figures, posters, collectible card games, and anything else imaginable. For something a little bit more quirky, you can also look into game technology. Special edition version of consoles, prototypes, accessories, odd controllers. It might take up a bit of space to have so many consoles and cords, but it’s a lot of fun for people to see a visual demonstration of how much gaming technology has changed, not to mention wonder what some companies were thinking when they released some of their weirder designs. Store displays. Posters, cut-outs and on-shelf displays are put up when a game comes out and often thrown away once the promotion ends. Promotional tie-in items. Lots of non-gaming products will feature tie-ins with game releases just like movies do. Remember the Halo-themed Pepsi products? Demo Discs. Back before downloading games, gaming magazines and other places would give free discs with demonstrations of new games. Comic books. Video game comics and manga adaptations exist for a lot of franchises like Legend of Zelda or Angry Birds, and many of these series are actually very good. Once you focus on what you actually want to collect, you probably wonder how you might build your collection. Gaming merchandise is a little different than games themselves, and thus offered in different places. The good news is sometimes following the herd has its benefits. Very popular AAA franchises and companies have merchandise everywhere. You can find Minecraft, Halo, Pokemon and Assassin’s Creed merchandise in almost any big box store. Walmart, Target and Toys R Us all carry a good selection of video game toys, t-shirts and some novelizations. These items sometimes go on sale or on clearance (I’ve seen Bioshock figures on clearance at Toys R Us for a few dollars a piece) and are easy to track down. These stores also price match, so if you find a similar toy on Amazon, you can get the lowest price. And because AAA merchandise is so plentiful, it’s easy to find at flea markets and garage sales for giveaway prices. In the same pile you find a stack of recently discarded PS3 games, you’ll probably find a Warthog Megablox set somewhere nearby. You might like Far Cry and Borderlands just fine, but your favorite games tend to be the slightly less popular or lesser known titles. JRPGs, Visual Novels and Indie games people may know or have heard of, but less people play. Usually there is merchandise associated with these titles, but they tend to be a little harder to find. All these items can be found online at various sites like, particularly from Japanese titles, at places that specialize in Anime figures. Anime and comic book conventions are also good places to look for gaming merchandise, though it isn’t easy to get the best prices unless you are willing to buy a bunch of stuff at once and do some serious haggling. Hot Topics carries some stuff as well, as do independently owned used gaming shops and Gamestop, though I don’t really endorse them. My best tip is occasionally scour comic book stores. Comic book stores tend to specialize in American titles and thus American merchandise, but aren’t as versed in the value of Japanese products. I’ve gotten some crazy deals on vintage Final Fantasy figures because the owners weren’t aware of how much they can cost. Flea markets, pawn shops and garage sales aren’t bad places to check, but be warned that a lot of bootleg merchandise comes out of there. Unfortunately when it comes to the known, but lesser marketed titles my advice is minimal: look everywhere, watch out for bootlegs and hope you get lucky with price or availability. You poor unfortunate soul. You picked up some obscure Japanese game or discovered the greatest indie game ever and are now in love with each and every detail of it. You go online only to discover that there is next to no official merchandise except for maybe the soundtrack or a special edition figure that only shipped with the limited version and is now insanely expensive. What is a collector to do? In times like these my best advice is this: fake it til they make it. If there is none or next to no official merchandise, a good idea is to go to video game, comic book and anime conventions and make a beeline to the Artist Alley. Artist Alley participants range anywhere from illustrators, doujinshi creators, leather workers and every color of the creative rainbow. And as such you find people who may have done arts and crafts of the obscure title you are looking for, or simply some amazing unofficial art of a known title that takes your breath away. One of my favorite games of all time is The World Ends With You and a few years back my table neighbor at Artist Alley was selling plushie Pig and Frog Noises. It may not be official, but it was beautifully made and I finally had something from one of my favorite games. Commissioning artists lets you get the cool things you want and supports a talented craftsperson, and when these items get enough attention, a lot of times renewed interest in the game results in official merchandise as well. Collecting gaming memorabilia is its own massive, intricate hobby, and this article is just a primer. I could do an entire series of articles about just figures and statues, and I don’t present myself as an expert on everything collectible when it comes to games. All I can do is offer the same sound advise as I do for any collectible field: do your research, know where to shop and figure out what you’re really interested in doing with your collection. And to those who wish to pursue this in addition or instead of a vintage game collection I wish you good luck and godspeed.